Sanchez completed 19 of 35 passes for 138 yards with no touchdowns and three interceptions in two games for the Redskins during the 2018 season. Analysis: Sanchez was handed a four-game ban for performance-enhancing drugs during the offseason and didn't sign with a team until the Redskins lost Alex Smith to a broken fibula in mid-November. 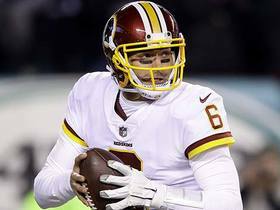 The 32-year-old was pressed into action when Colt McCoy (leg) joined Smith on the injured list, but it didn't take long for the team to turn to Josh Johnson instead. Given his putrid performance, Sanchez may have a tough time finding backup work for 2019. Sanchez won't be the Redskins' starting quarterback Week 15 in Jacksonville, Tarik El-Bashir of The Athletic reports. Analysis: During Sunday's 40-16 loss, the Redskins offense was putrid under the direction of Sanchez, compiling just 19 yards on 10 drives. With 5:31 remaining in the third quarter, he was pulled in favor of Josh Johnson, and the team rallied for all of its points on the day. Sanchez finished just six of 14 for 38 yards and two interceptions while getting sacked five times. After the game, coach Jay Gruden called Johnson the starting QB for Week 15, which could stand for the rest of the season. 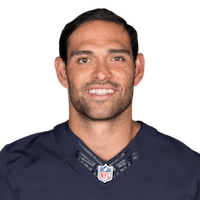 Sanchez replaced the injured Colt McCoy (lower leg) during the second quarter and completed 13 of 21 passes for 100 yards and an interception while finishing Monday night's 28-13 loss to the Eagles. 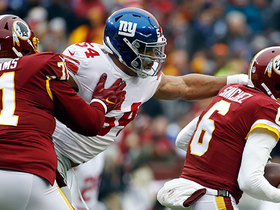 New York Giants defensive end Olivier Vernon spins through Washington Redskins offensive lineman Trent Williams for a sack. 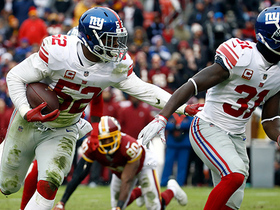 New York Giants linebacker Alec Ogletree intercepts Washington Redskins quarterback Mark Sanchez off a tipped pass. 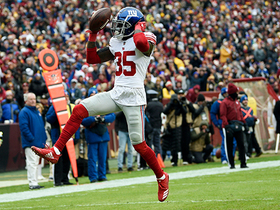 New York Giants safety Curtis Riley takes Washington Redskins quarterback Mark Sanchez's tipped pass in for a pick-six. Washington Redskins tight end Jordan Reed catches a first down pass from quarterback Mark Sanchez. 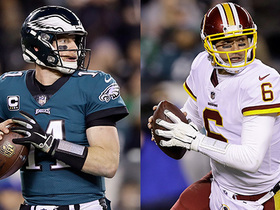 NFL Network's Kurt Warner joins "TNF First Look" to discuss whether quarterback Mark Sanchez can keep the Washington Redskins in the playoff race. 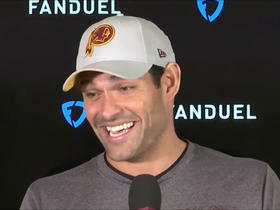 Washington Redskins quarterback Mark Sanchez talks about his running back Adrian Peterson's 90-yard touchdown run. 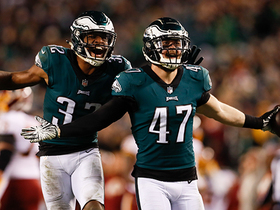 NFL Network's "NFL Fantasy Live" crew discuss the fantasy fallout from the Philadelphia Eagles' win over the Washington Redskins in Week 14. 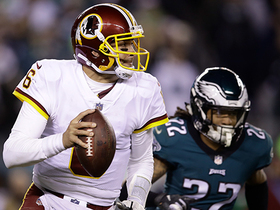 Washington Redskins quarterback Mark Sanchez keeps it on a first-down scramble. 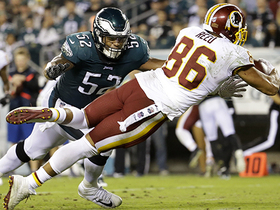 Philadelphia Eagles linebacker Nathan Gerry intercepts a pass from Washington Redskins quarterback Mark Sanchez. 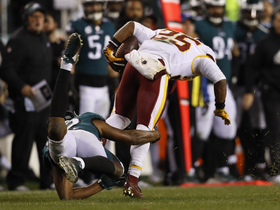 Philadelphia Eagles cornerback Rasul Douglas tackles Washington Redskins running back Chris Thompson after an attempted trick play.